If you’re hosting a backyard BBQ, pizza party or other event then the chances are you’re going to need a cooler to keep the drinks at just the right temperature for your guests. You don’t have to be using the best ice chest that money can buy for this, but you definitely want one that is worth the money. The last thing you want is to be using a cooler that can’t hold the temperature and melts all your ice before the event is over. Picking the right ice chest for you isn’t easy. There are a lot of options, shapes and sizes to choose from. That’s why we’ve covered all the bases and found the best ice chests for many different situations. Keep reading to find ice chest reviews, comparisons and tips and tricks to get the most out of your cooler. In the past, if you wanted a high-end cooler you’d simply buy a Yeti Cooler and be done with it. But now there are far more options, such as Orca. Orca are quickly becoming the brand to beat when it comes to high performance coolers due to their excellent insulation, durability and ease of use. 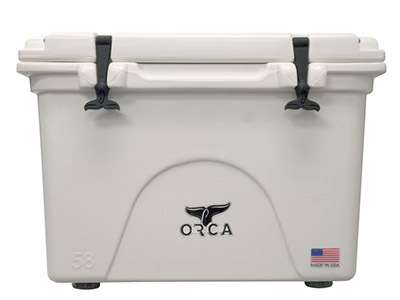 The Orca 58 Quart is one of the best coolers on the market for holding ice. It can easily last over 7 days with the same ice before it needs replacing. Whilst this isn’t that important if you’re simply hosting a party one evening, it also gives you the option to take it on your travels or if you’re just feeling lazy you can keep the ice in there for next weeks party. It also gives you the peace of mind that after several hours around the grill you’ll be able to open it up and it will be like no time has passed at all. Not only is it brilliant for holding temperatures for days on end, but it is also incredibly durable. The Orca is a rotomolded cooler which means that it is made from molded plastic. This way of making coolers produces an incredibly even and consistent product that is strong, durable and can keep ice for a long time. Lid gasket to ensure a perfect seal to help maintain ideal temperatures. Extendable flex-grip handles for comfortable solo or tandem transport. 100% manufactured in the US. There isn’t much wrong with the Orca. Our major gripes are with its lid, which has a tendency to slam shut. Not a big problem but it would be better if it didn’t happen. Like most ice chests, the Orca is a pain to drain despite the draining nozzle. Also, like most Orca coolers, this isn’t cheap. Overall, the Orca 58 Quart is the best all round cooler one the market. Despite its high price tag and a few minor flaws its ice retention time, build quality and ease of use make it our top cooler for any situation. Coleman are known for their affordable coolers and their Xtreme series of coolers are some of the best ice chests for the money. The Xtreme 120 Quart ice chest can hold a huge amount of drinks and ice. Up to 204 cans can fit in this. Whilst it may lack the durability of something like the Orca or a Yeti ice chest, it can still hold ice for up to six days at temperatures up to 32 °C (90 °F). Comparing the two, you can see that the Coleman has much thinner walls, but despite this it still does a great job at keeping the ice. It’s even made from a material that helps protect the cooler from the sun’s UV rays. A strong lid that can support up to 250lb. Perfect for a place to sit and rest. Leak resistant channel drain to make draining the cooler as easy as possible. There’s no need to tip it. Fairly good handles for simple transport. The handles are nowhere near as good as the multi-handles on the Orca or a Yeti, but they work just fine. Cup holders in the lid to keep drinks at easy reach. 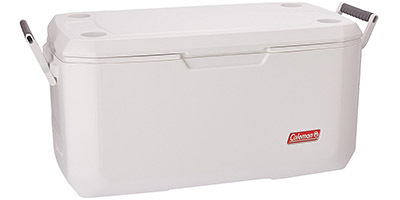 The Coleman 120 Quart Xtreme Ice Chest is a great product as it is. It’s got a huge capacity, it keeps ice very well and has a few small features that make it very easy to use. What elevates it way above just a great cooler is the price. You can find this for around $60-$100! If we compare that to the Yeti Tundra 125 you’re getting a similar product for almost a tenth of the price! This would make an idea ice chest for when you’re hosting anything, its huge capacity and great cooling capabilities mean that it can easily manage a large number of guests for hours and even days. Not only that but it has the versatility to be taken camping or tailgating. And all of this for a tenth of the price of a Yeti. This is the best ice chest for the money that you can buy today. With the best cooler cart category, we’re straying further away from general coolers/ice chests and getting close to more specialised ice chests that are more suited for only backyard events. The Trinity stainless steel patio cooler has an 80 quart capacity which will offer plenty of room for most get-togethers. You can fit roughly 40 beers and a few bottles of wine with ice in it. It’s ice retention is decent, it will last for 2 days but will then need replacing. This obviously isn’t as good as the previous two ice chests, but this is a very different product and is fine for parties. What we really like about the Trinity is the way it looks. It’s got a very clean, modern style to it that would make a great feature to many different back yards. It looks classy and stylish and wouldn’t look out of place in many upscale bars. The stainless steel gives it the silver color and means it won’t rust if left in the rain. The legs, tray and lids have a speckled finish which works very well with the shiny stainless steel. Wheels for easy movement. Two of these are locking to hold it in place when it’s needed. Attached bottle opener and cap catcher. Bottom shelf for additional storage. The Trinity does have a couple of small problems. The main being the need to tilt the whole thing when you want to drain it. This can be a pain and may take a couple of people to do it properly. Also, assembly may prove to be a bit of a chore but with a two people who know what they’re doing it can be quite quick. 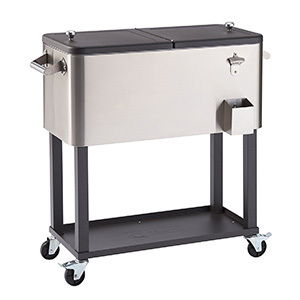 Overall, the Trinity cooler cart is a great product that does its job very well. It looks great, keeps ice long enough for any event and it’s a great addition to any back yard. If you’re looking for a practical and stylish cooler then this is the one to buy. We’d recommend picking up a protective cover if you decide to go with this. Ice chests and coolers aren’t always made from plastic or metal. 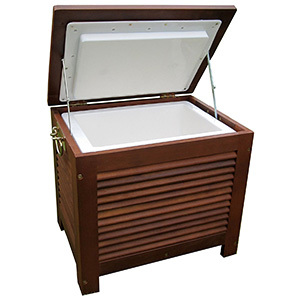 Wooden ice chests are a bit like cooler carts in that they are mainly built for their aesthetics. Comparing wooden coolers to the best rotomolded cooler will leave you hugely disappointed if you’re looking for maximum ice retention. They’ll keep ice frozen for a solid 6 hours but anything more than a long evening’s merriment and you’ll be starting to deal with water. Despite this they make a great addition to a garden or patio and if you’re hosting smaller pizza parties or barbecues then one or two wooden patio coolers could be perfect. Our favorite wooden cooler is the Merry Garden Wooden Patio Cooler. It’s a stylish, elegant looking cooler that would look great in many gardens. It has an outer layer of real eucalyptus hardwood that has a beautiful oil-stained finish to it. This is certainly the most sophisticated cooler on the list, which just about makes up for its lack of size and ice retention abilities. It certainly isn’t terrible at keeping ice as it has a double walled, insulated plastic interior. But you’ll be looking at around 6-12 hours of ice time. It has a capacity of around 34 quarts which is enough for around 24 cans. Two steel handles for easy transport. It has an easy drain plug that works fairly well. Overall, this is a great little cooler that has a very specific use. It obviously can’t be used for camping or tailgating, but is perfect as a patio cooler. As the size is relative small, you might want to pick up a couple if you’re going to be using it as storage for larger get-togethers. Despite the drawbacks, it still looks fantastic and works well. You’ll struggle to find a better wooden ice chest than this. If you’re looking for a cooler with a lot of storage space then you’re in luck. The Yeti Tundra 250 comes with 250 quarts of storage space (surprise). You can fit hundreds of cans in this, but what it is better used for is storing larger cuts of meat or fish. So, if you’re going to be barbecuing somewhere where there isn’t a power outlet or refrigeration then one of these is perfect. The Yeti Tundra series of ice chests are all rotomolded meaning they can take a beating and still be fine. They use Yeti’s ‘FatWall’ design. This is where the walls are up to 3 inches thick of insulation and super strong plastic. The result means that you can easily keep ice for days on end and the structure is strong enough to be certified Bear-Resistant. Yetis ‘NeverFail Hinge System’. We’re big fans of Yeti’s hinges and think they’re probably the best on the market. Yetis have some of the best handles on any coolers. The Tundra is no exception and has nylon rope handles with textured grips, in addition to the integrated handles that make carrying this huge cooler around much easier. The Vortex Drain System makes draining the Yeti 250 very simple. Turn your Yeti Tundra into a comfortable seat with the Yeti Seat Cushion. Overall, the Yeti Tundra 250 is an amazing ice chest. It has enough space to store all the meat or drink you could need for a decent size get-together. Not only this, but the quality is immaculate. It’s solid, rugged and can keep ice for days. 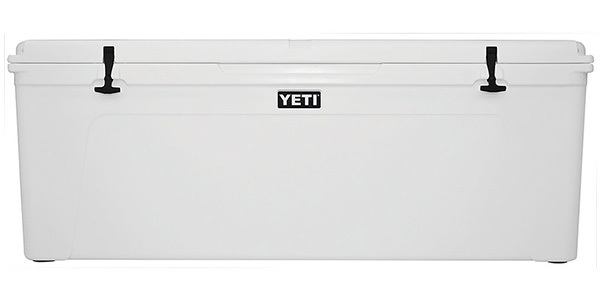 If you’re looking for an extra large ice chest then the Yeti Tundra series of coolers are some of the best on the market. The only problem being the price. Like most Yetis the Tundra’s are not cheap. If you’re looking for even more storage space then Yeti have you covered with the Yeti Tundra 350. That’s most of the serious contenders covered. Now onto something a little more fun. If you’re lucky enough to have a pool or have access to a nearby river or lake then what better way to spend your days than relaxing on the lake with a few drinks. And what better cooler to have than a floating one to keep by your side so you never have to leave. 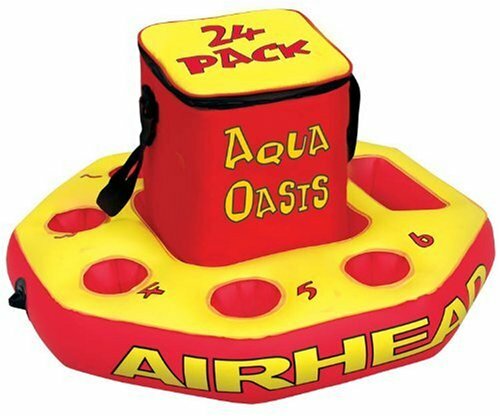 The Airhead Aqua Oasis is an ideal choice for those of you looking for a floating cooler. It’s made from a leak-proof nylon so it’s extra strong. It’s fully insulated and can keep ice for 12-24 hours depending on the ambient temperature. It has a really nice design feature that allows you to remove the actual cooler bag from the inflatable base. This means you can use it as a standard cooler bag as well. It’s generally fairly lightweight and easy to transport and inflating the base is very easy. Can hold up to 24 cans in the main cooler with ice. Has 6 cup holders and a larger holder for suntan lotion or anything else. Has a molded plastic rope connector that can be used to tether the Aqua Oasis to other inflatables. Overall, the Airhead Aqua Oasis is a great little floating cooler. It’s perfect for what it does and it convenient and easy enough to transport that it never becomes a hindrance. The only problem we have with it, is that it’s not particularly good looking. In fact, we think it’s really quite ugly. Not a massive problem as it’s so functional. So, if you’re looking for the best inflatable cooler then the Airhead Aqua Oasis is a great choice. If you’re looking for an all in one music system and food or drink storage system then a cooler with speakers is exactly what you need. 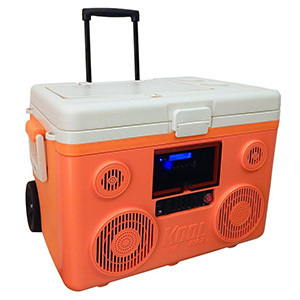 The Tunes2Go KoolMax is primarily a 40 quart cooler than can hold up to 48 cans for 3 days. But what makes it a little bit special is the integrated 350 Watt speaker system. This can play music from many different sources. It has built in Bluetooth, has 2 standard 3.5mm auxiliary jacks, a USB port and an SD card slot. Not only that, but it also has an FM radio with two built in 6.5 inch Hi-Fi water resistant speakers and two performance tweeters. Powered USB port for charging. A built in rechargeable battery that can last up to 16 hours. Weather resistant storage for smartphone charging. Telescopic handle for easy transport. As you can see there are a lot of features that the Tune2Go cooler has. You’ve got the huge convenience of having a very respectable speaker system and a great cooler all in one. This is perfect if you’re thinking of hosting a party and is great for taking camping or tailgating. The speakers are very good and it’s all generally well built and easy to use. There are a couple of little problems that people are having though. These tend to revolve around the electronics. Overall, we’d recommend this to anyone looking for an all in one system with a tonne of little extras. Having an XLR input means that it can turn your event into a karaoke party with ease. There really is a lot of potential with this. If you’re looking for an ice chest with speakers then this is the one we’d recommend. Pre-chill the cooler and whatever is going inside. Many think that you’ll get the most out of your cooler if you put warm drinks into them. Whilst you will get the largest temperature change in your drinks, you’ll be getting a very inefficient use of the ice. The best thing to do is to try and pre-chill your cooler and your drinks to get the most efficient use of ice and the best overall performance of your ice chest. Load the ice last. This will help with organisation and as cold air sinks you’ll get better performance when your meat or drinks are placed at the bottom of the cooler. Keep your cooler out of the sun. This might seem obvious, but if you’re looking to get the most out of your cooler then moving it into the shade will likely add days onto the lifetime of the ice. Keep your lid shut. Again, this might seem obvious but leaving your lid open is a very bad idea. When you go to get a drink try to be as efficient as possible and grab everyone a drink. Also, make sure you close the lid properly every time. Do this and keep it out of the sun and you’re likely to get a much better performance straight away. Use cold ice. This may seem silly, but a high quality ice that has been deeply frozen can be several degrees colder than ‘wet’ ice. Use the correct ice for your needs. Block ice or cubed ice? Block ice will last longer in your cooler but cubed ice will cool your contents quicker. Pick what will suit your needs best if you truly want the most from your ice chest. Keep your cooler clean. Make sure to wash your cooler with a mixture of liquid soap and warm water. Then dry it out quickly after washing to stop any mildew from setting in. We hope this has helped you get a better idea of the type of ice chests that are best for your backyard get-togethers. If there’s anything you think we missed or you’d like to know then let us know in the comments below.